In my last blogpost I talked about how I started in toy-photography. . Although my main concern at first was creating decent photos, my main interest came down to story-telling. While single photography brought me pleasure and such, I always felt there was something missing. As everyone in this world does at some point in their life, I decided I wanted to write a book someday. I’m no different. I’m a person that usually contemplates a project over and over… and over again. Yet, in the end I don’t even start working on it. This time was different; I even took some lessons in creative writing. The results from that course weren’t all that bad, but I understood that actually writing a book would be way out of my league, so I shelved my plans on writing a book again. 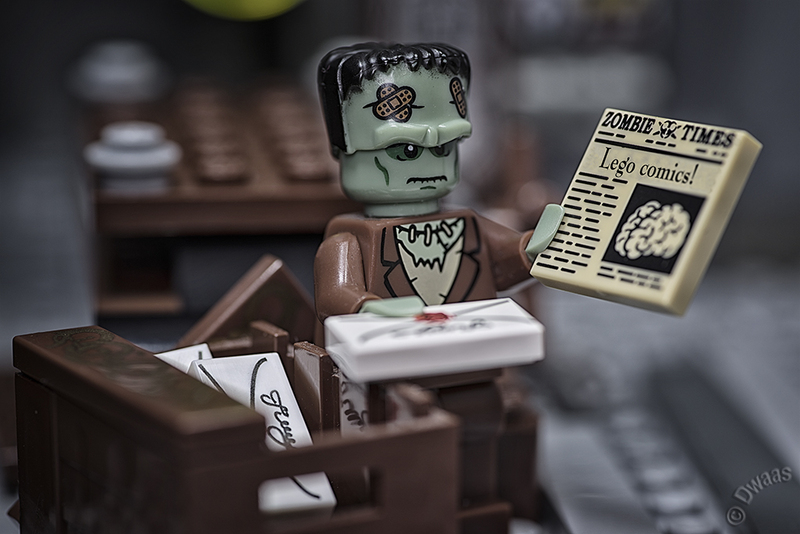 A few years later I came across another phenomenon on the Internet; Lego-comics! At that instant, everything came together. 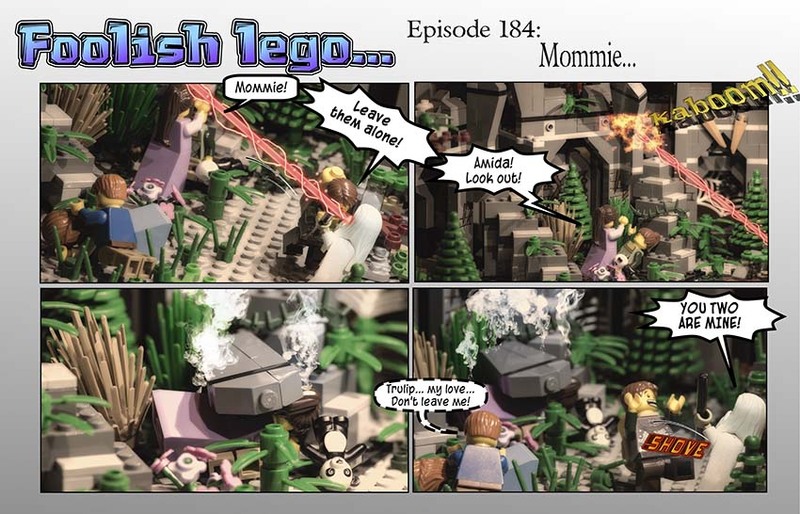 I figured Lego-comics was something I could do, since I was already doing daily photography. How different could it be, right? So again; I simply started, not being bothered by my lack of knowledge on just about everything concerning comics. 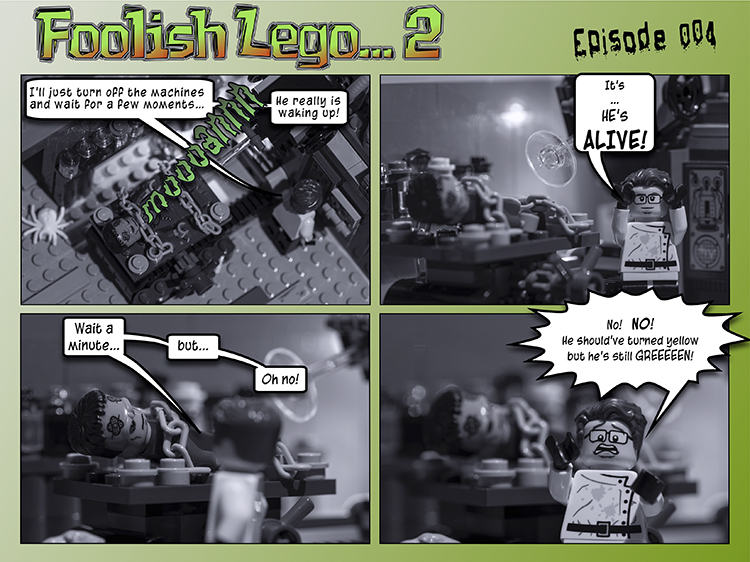 The Foolish-Lego comic was born. The first episode went up on my daughter’s birthday four years ago. The first comic ran for 287 episodes and took about 2,75 years to end. As I said, I had no idea what I was doing. All I had was a crude thought about where I was going with the story the first couple of episodes, but didn’t have a clue on how I was going to end it. I didn’t even know what characters I was going to include and I never heard of the words ‘(crude) outline’. Almost all episodes were written and shot on the fly. The day I was going to publish an episode, I wrote the script, shot the photos and created the episode. What the next episode would bring I didn’t know. As a result, the story felt very unbalanced and was influenced by the amount of time and inspiration I had on the day an episode needed to be published. There was so much wrong with that comic. For instance, there wasn’t a descent plot, there was little -if any- character development and there were countless loose ends. Lighting and effects were especially annoying to me. These differed per episode and I couldn’t get them consistent. The reason for that was that I didn’t have a setup like I have now. I shot on different locations and with differing light sources (‘normal’ lights, flashlights, phone-lights, x-mas lights, etc…). Because of this, the effects in Photoshop had differing results (they also differed because sometimes I forgot what I did the last episode). This episode shows the inconsistency in lighting/ color-balance even within an episode. Between episodes it’s much clearer. Another thing was that my main protagonist didn’t really do anything. If I took him out of the story, the events might still have unfolded mostly as they did, frustrating. At that time, I didn’t know what a character-driven plot was. As the comic proceeded I took most of my pleasure out of some of the side-characters (Like Daryl, Willy and Venator & Hammie) who at least had distinct personalities, albeit flat. In the first comic there were scenes I was happy with. This is a scene that did move the story forward and was fairly consistent. However, this scene was very heavy on Photoshop and took a lot of time each episode to do right. So, at the time I was happy this scene ended. During the running of that comic I hit the books and asked around on all kinds of things, story-telling, camera-positions, (lighting) set-up, creating characters, plot-development and such. By the time I knew a bit more, I got so frustrated by the flaws in my comic I had to end it. And so I did. The ending (when I finally thought of one) was (ironically) inspired by the ‘Neverending story’ and even to me it didn’t feel that satisfying. Yet, it had to be done, I wanted to do better! Now I’m about 100 episodes into comic two (which also started on my daughter’s birthday, did I mention that I am a sucker for traditions). This time I had a plan! I started writing a crude script for the whole comic (that I already revised a thousand times by now), created a decent studio set-up and decided on a few characters with distinct personalities and desires. This time I would focus on my own alter(L)ego Dwaas. Also, there would be some connections to the world in the first comic and to characters in my single photography. I also wanted to bring some meaning into the story. And even though it might feel a little slow this time around, I am reasonably happy with the progress up until now. Technically I am investigating camera positions, composition, elements of cinematography, mood and lighting. This time I want to bring some balance and stability to the setup, at the very least within a scene! Now I shoot the comic scene by scene, which takes me 1-2 days per scene for the shooting and composing. Technically I am investigating camera positions, composition, elements of cinematography, mood and lighting. This time I want to bring some balance and stability to the setup, at the very least within a scene! Now I shoot the comic scene by scene, which takes me 1-2 days per scene for the shooting and composing. I hope to write more on specific aspects of how to create a Lego comic next time. Dwaas’ beliefs get him in trouble many years little in multiple areas in his life, as becomes clear as the story progresses. Will he be alright in the end? While writing this blogpost, I re-read the first comic and I was positively surprised to notice that I felt it to be rather entertaining. I can partly see through the flaws now. Anyway, If you would like to read it, the first story starts here, the second (ongoing) comic starts here. Have you ever considered starting a comic, or have you started one?